Good platforms give your products a competitive advantage in cost, speed, uniformity and other benefits. ARE YOU READY TO DIVE IN? Sounds good, but what is a platform? A platform bundles together elements that are common across product lines. By not having to recreate the wheel, product development is faster, easier, more efficient, more reliable and less costly. Let’s look in more detail at the structure of a platform in Figure 1. 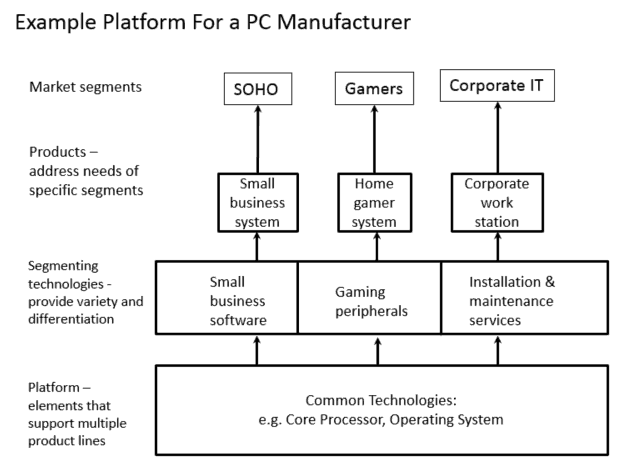 This diagram illustrates the use of a platform for a PC manufacturer. The platform at the bottom of the diagram lists some of the common elements of a PC: the operating system and core processor. The standard PC can be customized for different market segments by adding on software, hardware and services. For a small business, accounting and productivity software is added. For a home gamer, special peripherals like an upgraded sound card, display and speakers are added. For corporations, services covering installation and maintenance are added. While platforms provide many advantages, they also constrain options available to the product developer. For example, building a website in WordPress makes content creation and management easy. But, if a desired feature is not available in WordPress, a decision has to be made about whether to modify the platform, create the feature outside of WordPress or forgo the feature. Given the opportunities and constraints created by the platform, the platform and product strategies need to be developed in parallel. What is in a platform strategy? We find that the most difficult challenge in designing a platform is the trade-off between maximizing the efficiency of the platform, and maximizing the ability to create distinctive products for the different market segments. Generally, the more elements in common in the platform, the lower the cost of product development, but also the less opportunity for creating original features and benefits. Platform Approach – The organization’s approach to creating and managing a platform is influenced by the goals of the product categories supported by the platform. Alternatively, the platform can be designed to provide more variety to existing segments through additional levels of performance and price points (some companies have good/better/best models). Another approach is to establish a beachhead in one market segment and performance level, then branch out in either direction as opportunity arises. The last diagram in Figure 2 illustrates niche-specific platforms, which will generally be less efficient than the other approaches. Another consideration is whether to make the platform modular, meaning independent sets of components can be combined and varied to create different products. Modularity allows great flexibility but it requires standardized interfaces that enable the modules to connect and communicate. Android phones are an example of a modular platform. Google provides the operating system, phone manufacturers create their own hardware compatible with the operating system. App developers create small programs designed to run using the Android operating system. The three elements communicate through standard interfaces and deliver different experiences depending on the configuration. The management of the interfaces is crucial to the success of the modular platform. Apple’s iPhone is an example of an integrated system: Apple controls the hardware, the software and the services to deliver a seamless experience. Platform Infrastructure – This describes the specific skills, practices, organizational structure and assets needed to support the platform. Companies may have dedicated departments to support major platforms. For example, in the automotive industry there are platforms that cross multiple car models. Given the enormous investment required for these platforms, it is common to have a dedicated team of developers devoted to chassis and unitized frame platforms. Let’s look at a simple fire damage restoration service using a modular platform, Figure 3. 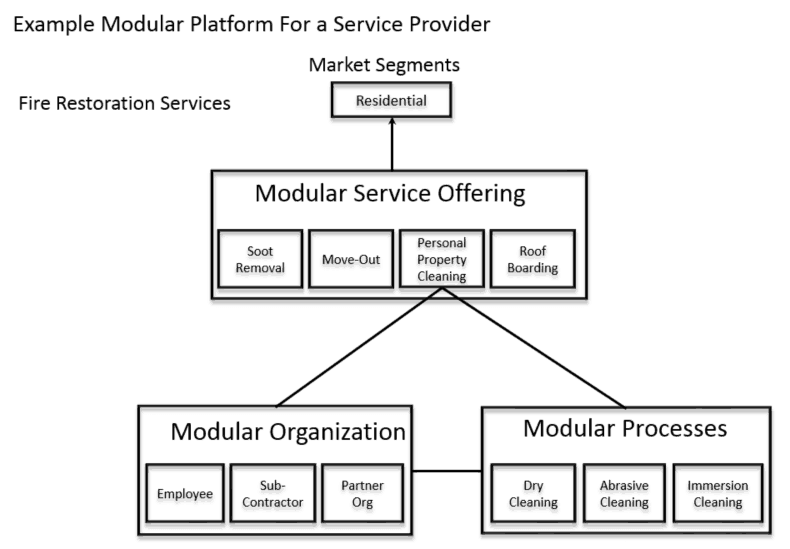 The diagram show 4 different service modules offered to residential customers: soot removal, move-out packing and storing, personal property cleaning and boarding damaged roofs. These are very different services requiring different skills, tools and processes. Depending on the types of personal property to be cleaned, three different modular processes are available: dry cleaning, abrasive cleaning and immersion cleaning. Depending on the processes required, employees, sub-contractors or a partner organization may be used. A customer chooses the service they require and the company assembles the appropriate service and organization modules to deliver the services. Platforms are not appropriate for all companies all the time, but the potential benefits make it worthwhile to evaluate whether a platform can help your business. As a first step, see if you can create a chart like Figures 1 or 3 for your product lines. [i] David Robertson and Karl Ulrich, “Planning for Product Platforms,” MIT Sloan Management Review, Summer 1998. [ii] Marc H. Meyer, “Revitalize Your Product Lines Through Continuous Platform Renewal,” Research Technology Management, Mar/Apr 1997.